For all we know, BJJScout could be a disembodied Skynet metamind that’s programmed to analyze BJJ, only to one day terminate all humankind. Is BJJScout really Keenan’s split personality, a jiu-jitsu version of Tyler Durden? Or will we wake one day to find BJJScout has vanished from the world, never truly existing except in our dreams? Your guess is as good as mine. Whatever robot or mythological creature they may be, in a recent post, BJJScout reviewed my instructional Mastering the Crucifix, calling it “groundbreaking… a bold and different approach to BJJ pedagogy” and praising Artechoke Media by saying “Passion for BJJ belies each effort they put out.” BJJScout gives us credit for not doing the usual “get affiliates to cram pre-order spam down everyone’s throat” routine, and praises our willingness to explore new and different ways to present information (i.e. animated gifs, multiple angles, combining animation/video with text, etc.). Read BJJScout’s full review here. 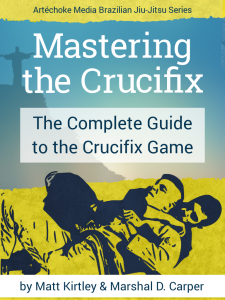 Buy your copy of Mastering the Crucifix here. Next Get answers to your dumb questions at WhiteBeltProblems.com!